In a statement that ought to scare the hell out of the bears Citigroup Says Buy Bank Puts Because Rally Will Fade. Investors should buy put options on financial companies because derivatives-market trading suggests the industry will retreat after a 43 percent surge since March 6, Citigroup Inc. said. “Despite the rally, credit and option markets are pricing in increased downside risk,” New York-based Citigroup strategist Alvin Wang wrote in a note sent to clients today. He recommended puts giving the right to sell the Financial Select Sector SPDR Fund, an exchange-traded fund that tracks a basket of bank stocks, for $8 before May 15. The XLF, as the ETF is known, added 5.5 percent to $8.81 in New York, bringing its gain since March 6 to 43 percent. The May $8 puts fell 25 percent to 70 cents today. Inquiring minds are investigating the top XLF holdings as well a couple component charts. 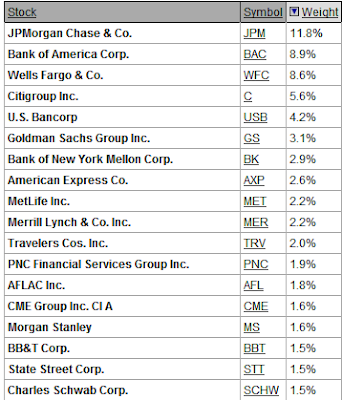 JPMorgan (JPM), Bank of America (BAC), Wells Fargo (WFC), and Citigroup (C) are the four largest components comprising 34.9% of the total weighting of XLF. Is this really a good time to short these stocks? Let's take a look. Citigroup is essentially telling investors to bet against JPMorgan, Citigroup, Bank of America, and a whole slew of financial stocks that have been smashed to smithereens. Pardon me for asking, but where was this advice a year ago, or six months ago, or even three months ago? I am not particularly bullish on financials right now, but perhaps I ought to be on the grounds that Citigroup has not gotten anything right during this economic decline and is now recommending a bet against itself. Indeed, Citigroup's recommendation could be a nice contrary indicator especially as More Ugly Details Emerge On "Geithner's Heist America Plan". Inquiring minds are reading FASB Eases Fair-Value Rules Amid Lawmaker Pressure. The Financial Accounting Standards Board, pressured by U.S. lawmakers and financial companies, voted to relax fair-value rules that Citigroup Inc. and Wells Fargo & Co. say don’t work when markets are inactive. The changes to so-called mark-to-market accounting allow companies to use “significant” judgment when gauging the price of some investments on their books, including mortgage-backed securities. Analysts say the measure may reduce banks’ writedowns and boost their first-quarter net income by 20 percent or more. FASB voted 3-2 to approve the rules at a meeting today in Norwalk, Connecticut. “Good decision,” Citigroup Chairman Richard Parsons said of FASB’s move. The market for mortgages and other assets was not working, so something had to change, Parsons said in a New York interview today. Fair-value “provides the kind of transparency essential to restoring public confidence in U.S. markets,” former Securities and Exchange Commission Chairman Arthur Levitt said in an interview yesterday. By letting banks use internal models instead of market prices and allowing them to take into account the cash flow of securities, FASB’s changes could raise bank industry earnings by 20 percent, according to Robert Willens, a former managing director at Lehman Brothers Holdings Inc. who runs his own tax and accounting advisory firm in New York. That Citigroup says it is a "good decision" is probably all you need to know that it's not. Mark-to-Fantasy pricing is not going to restore long term confidence but it could affect the markets in a favorable manner short term. So far the XLF is up another 3% so far today although anything can happen by the close. I do not have the exact time of day of that Citigroup call, but if it was in the morning, the timing could hardly have been worse for PUT buyers. Looking at the above chart, those $8.00 strike May PUTs are likely to expire worthless. If so, I have to ask the question: Can anyone at Citigroup get anything right?